There is a refreshing patriotism that shines through with Steven Naismith. The path of the Norwich City’s forward’s football career means it is five years since he has lived in Scotland. His homeland, where he will be spending his summer break, lives in him, though. At only 30, his thoughts are not turning to a time when he won’t be playing the game. However, Naismith has pondered doing so again this side of the Border. The wage the striker is currently picking up means he is well aware that there are no certainties about whether he will be allowed to help the Carrow Road club progress next season. The failure to get out of the Championship they were consigned to the previous campaign means Naismith – signed from Everton for £8m in January 2016 as the club spent big in attempting to avoid the drop – has become a player on a top-flight salary as Norwich budget for being a second-tier side. The sort that they might not be able to afford in future, with new German manager Daniel Farke tasked with refreshing the squad by attracting affordable young talent. “The club have kind of said that in the past [they are going to pursue a different player financial model] but with the new structure at the club I’m going to go back and hopefully help the club out of the division. The longer it does go on the harder it’s going to be. Especially with a new TV deal for teams coming down, they’ve made it every year harder and harder. The teams coming down can kind of over-invest, if that’s the way they want to go. Naismith, who has sat his B licence, wants to be impressed by the football produced in his homeland. That is not happening, alas, but he is passionate about change for the better. A smart individual, he gives the impression of being equipped to play a role in the development of his national sport at boardroom level. “In all honesty I’ve never, ever thought about it,” he said. “I just watch Scottish football all the time and think that I want to live the rest of my life in Scotland, go to football matches and enjoy them. I want to think ‘what a product we have here’. “We’re bringing youngsters through just to make money. A constant conveyer belt. We’re a small country compared to England and that’s a comparison that’s unfair. They have a league that’s amazing, it’s marketed in an amazing way. We need to know where we’re at and what we can do. 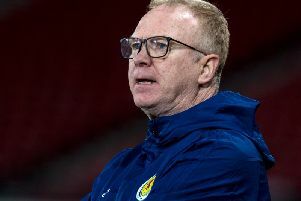 “We have teams playing on astroturf because it benefits them budget-wise but, for the good of Scottish football, we need to be a professional level at a high standard that people want to watch. Whether that’s changing to summer football, changing to one body controlling everything in football, there’s so many things that need to change.